Convenient facilities mean quality healthcare is always close to home. A community hospital that delivers world-class healthcare while keeping you close to home is the best of all worlds. That’s exactly what Marshall Medical North is to the residents of Marshall County and surrounding areas. It means highly-skilled doctors who also are your neighbors and friends. It means caring and compassionate nurses you run into in the grocery store and at church. It means the most modern equipment and technology acquired by leadership dedicated to protecting the health of their families and co-workers. Marshall Medical is a 90-bed acute care facility built in 1990 as part of Marshall Health Systems. 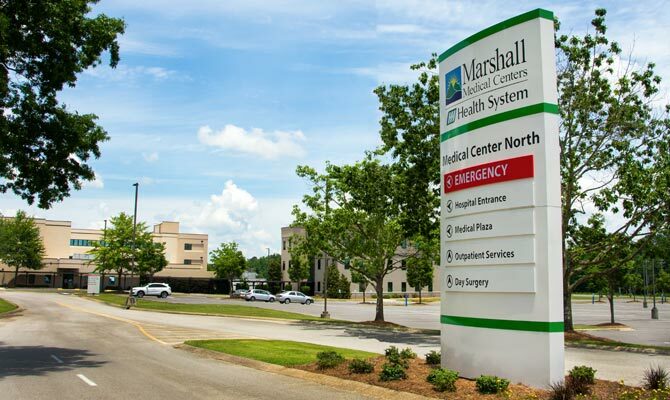 It serves the north end of Marshall County and surrounding areas while its sister hospital provides care on the southern end. Convenience for residents, compassion for patients and care for the community. That’s Marshall Medical. The Emergency Department at Marshall North is a certified Trauma III Emergency Department that is serviced by four emergency helicopter transports. It treats an average of 30,000 emergency patients each year. Next door to the hospital sits TherapyPlus, providing a wellness facility for the public and physical therapy for patients. It features a 22,000-square-foot outpatient rehabilitation and wellness center with a 75-foot lap pool. The facility is voluntarily accredited by the Joint Commission on the Accreditation of Healthcare Organizations.